Basic parameters/bbrbr Frequency Range: Receive: 0.5 ~ 30MHz (Emissions: All HAM bands)br Work mode: SSB (J3E) / CW (A1A) / AM (A3E)br The minimum frequency step: 1Hzbr Antenna Impedance: 50Ωbr Operating temperature range: -10 ℃ ~ + 60 ℃br Frequency stability: ± 0.5ppm @ boot 5 minutes, -10 ℃ ~ + 60 ℃br Operating voltage: 12 ~ 14.5V DCbr Current parameters: reception 600mAMax (Emission 7.5AMax)br Machine size: 120 * 45 * 180 (mm) [not including knobs, handles, and other prominent]brbrTransmitter/bbrbr Transmit power: 20W (@ 13.8V)br Mode: SSB balanced modulator, AM modulated lowbr Spurious rejection: ≥40dBcbr Carrier suppression: ≥45dBcbr Selective: SSB 2.4kHz (-6dB), CW 500Hz (-6dB)brbrReceiver/bbrbr IF frequency: 10.7MHzbr Receiving sensitivity: 0.5uV (PRE ON, ≤2.0MHz), 0.3uV (PRE ON,> 2.0MHz)brbr Reception band:br 1.8 ~ 2.0MHzbr 3.5 ~ 4.0MHzbr 5.0 ~ 5.5MHzbr 7.0 ~ 7.3MHzbr 10.0 ~ 10.2MHzbr 14.0 ~ 14.5MHzbr 18.0 ~ 18.2MHzbr21.0 ~ 21.6MHzbr 24.8 ~ 25.0MHzbr 28.0 ~ 28.8MHzbr 0.5 ~ 30.0MHz (*)brbr Dynamic range: better than 90dBbr RIT frequency tuning range: ± 1kHzbr Audio output: 0.5W@8 ohmbrbrPackage List/bbrbr 1x X-108G HF Transceiverbr 1x PTT Micbr 1x Power cablebr 1x USB cablebr 1x Manual 1. Installation problem in the factory. Some devices may be installed wrongly on internal wires or accessories, this may lead the machine turns off by itself or become warm during working. 2. Low quality of components which used to produce this product. Uneven quality of materials which are used to produce this product may lead some machines get noise during transmitting. 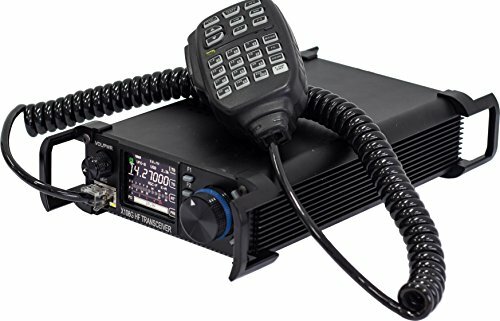 X-108G upgraded from X108 and it is outdoor version for car, motorcycle and more. Receiving sensitivity: 0.25uV (preamplifier open,> 1.8MHz band). Narrow double-tuned band-pass filter covering the realization of all amateur bands (WARC bands). X-108G is with Host + Handle + 2.3khz filter + 500Hz CW filter + 0.5ppm TCXO. The package includes hand PTT speaker mic with keypad, Power cable, USB Cable and the manual.